1 Smoking was once fashionable in America. It wasn't long ago that non-smoking passengers on airplanes and customers in restaurants had to breathe in clouds of someone else's smoke. The bad health effects of tobacco were not known back then. Tobacco was initially used in pipes, for chewing, and for snuff. Cigarettes didn't become popular until after the Civil War. 2 The first American cigarette factory opened in 1864. It produced nearly twenty million cigarettes that year. As early as 1901, anti-cigarette activities were beginning, but it wasn't enough. 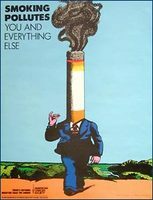 The tobacco companies began an all-out campaign to promote smoking. During World War I, cigarettes were given to soldiers with their rations. Cigarettes were included in soldiers' rations during World War II, the Korean War, and the Vietnam War. Advertisements were used to make smoking cigarettes seem fashionable. Movie stars promoted certain brands of cigarettes. Many tobacco companies aimed their ad campaigns at women or young people. 3 That changed in 1952 when Reader's Digest published an article titled "Cancer by the Carton." The article was about the dangers of smoking. The sale of cigarettes went down for the first time in twenty years as a result. In the 1960s, the Surgeon General's Advisory Committee on Smoking and Health released a report that said, "Cigarette smoking is causally related to lung cancer in men." Five years later, Congress passed the Federal Cigarette Labeling and Advertising Act. It required the surgeon general's warnings on all cigarette packages. All broadcast advertising was banned in 1971. In 1975 the military finally stopped supplying soldiers with cigarettes. Smoking was banned in 1990 on all interstate buses and all airline flights within the U.S. that lasted six hours or less.